Avatar spots, poses spots and seat nodes all refer to the same feature, the places avatars appear when entering or moving around a room. When used they trigger an avatar action, typically an animated sequence or static pose, by default the standard ‘sitting’ or ‘standing’ animations, or with some minor modification custom actions or poses. A room can contain any number of seat sets, usually determined by the rooms size or complexity, but there will always be six as a minimum (allows six avatars into a room). See here for more information on furniture nodes[link ‘furniture skeleton’], Catcher & Pitcher nodes, and Seat Handles. IMPORTANT: if there are fewer than six avatar spots, IMVU automatically inserts the missing component/s, often placing them close to skeleton.Room which may position them awkwardly relative to the room or desired usage. Note also, the number of avatars that can use a room at the same time is determined by how many seats the room has, not what might be available through furniture placement. 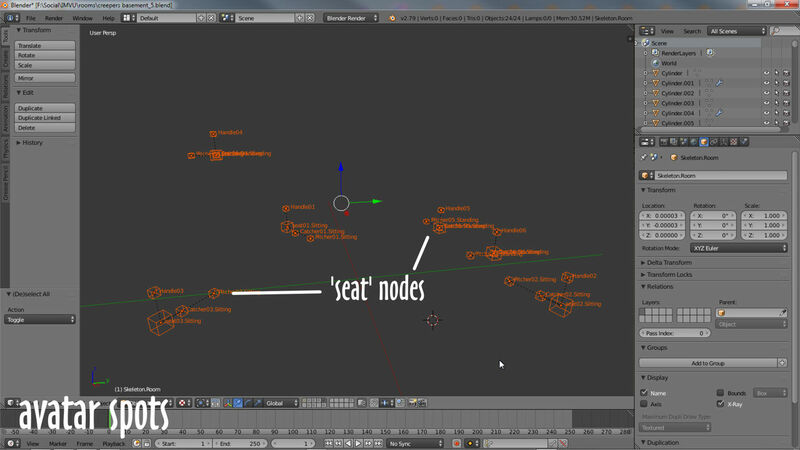 Seat nodes. 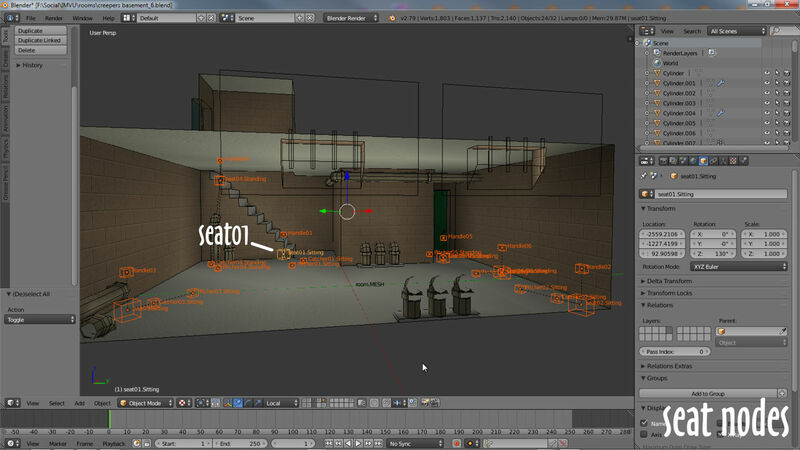 Creepers basement set up with some seat nodes (only seat nodes shown for clarity). By default they will trigger standard sitting or standing avatar poses but can be used for custom made avatar actions with some minor changes. IMPORTANT: avatar spots can be parented to animated features, which are in-turn parented to skeleton.Room, a furniture node that races around a track giving the impression of a car being driven for example. Avatar Spots. Seat nodes or avatar spots are placed around a room in clusters as each spot consists of four node; where the avatar actually appears, the user interface element and an interactive pairing. Each set can trigger a default or custom pose. Object, then Object (Keep Transform) in the Set Parent To pop-up that appears. Everything will be linked together in the correct order and controlled by skeleton.Room. IMPORTANT: when selecting nodes to Parent, first select the nodes to be linked to skeleton.Room then add skeleton.Room – skeleton.Room must be selected last to ensure proper relations are established between nodes (same applies to using Armatures and linking bones together). Good Parenting. 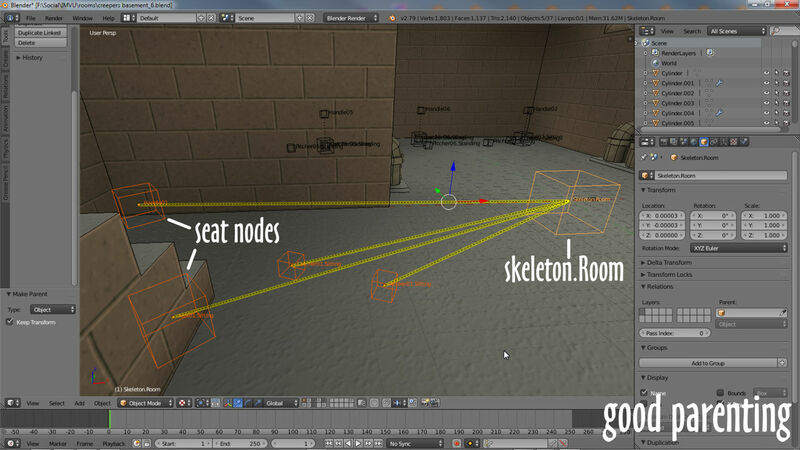 Seat nodes need to be linked to skeleton.Room room directly, not to each other – select seat nodes first then skeleton.Room before parenting from Object » Parent » Object » Object (Keep Transform).